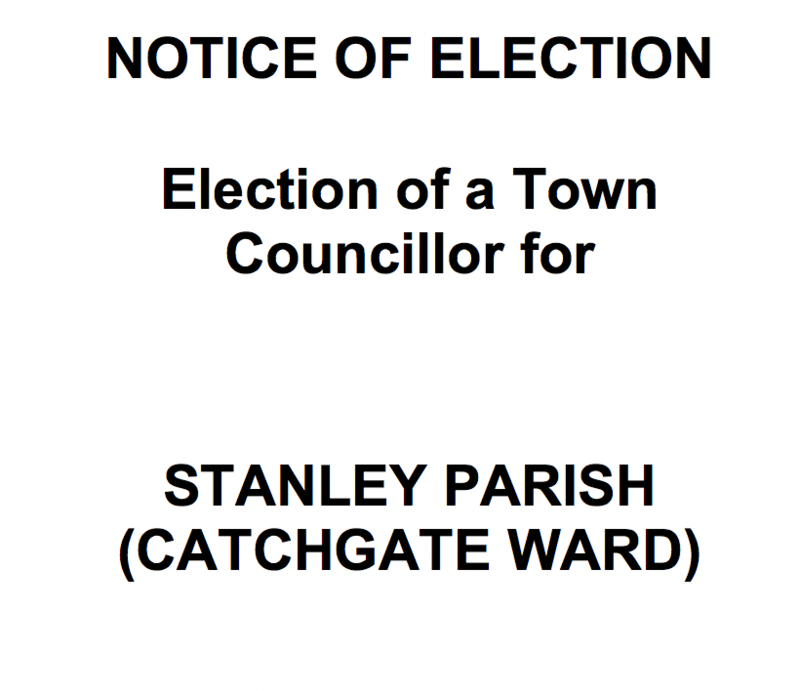 An Election is to be held of One Town Councillor for Stanley Parish (Catchgate Ward). Forms of nomination for the Parish Election may be obtained from the Clerk to the Parish Council or the Returning Officer, Room 1/104-115, County Hall, Durham, DH1 5UL, (between the hours of 10.00am and 4.00pm) who will, at the request of an elector for any electoral area prepare a nomination paper for signature. 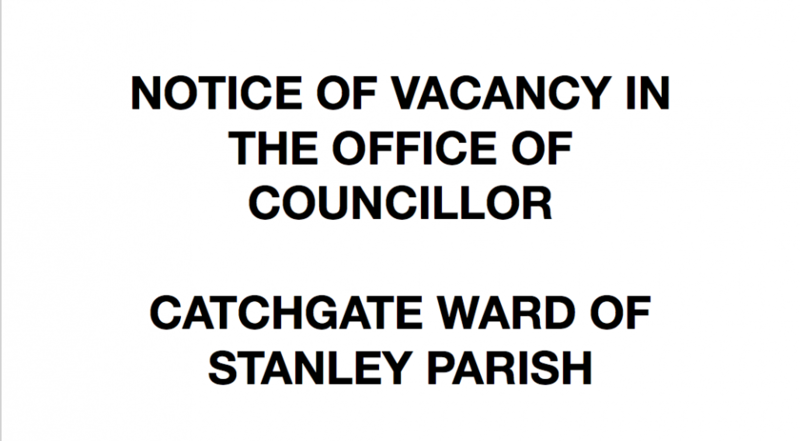 Nomination papers must be delivered in person to the Returning Officer, Room 1/104-115, County Hall, Durham, DH1 5UL (between the hours of 10.00am and 4.00pm), on any day from the date of this notice but no later than 4 pm on Wednesday, 2nd May 2018. If the election is contested the poll will take place on Thursday, 31st May 2018. Applications, amendments or cancellations of postal votes must reach the Electoral Registration Officer at Room 1/104-115, County Hall, Durham, DH1 5UL by 5 pm on Tuesday, 15th May 2018. Applications to vote by proxy at this election must reach the Electoral Registration Officer at Room 1/104-115, County Hall, Durham, DH1 5UL by 5 pm on Tuesday, 22nd May 2018. Applications to vote by proxy at this election applied for on grounds of physical incapacity, where that physical incapacity occurred after 5 pm on Tuesday, 22nd May 2018, must reach the Electoral Registration Officer at Returning Officer, Room 1/104-115, County Hall, Durham, DH1 5UL by 5 pm on Thursday, 31st May 2018. 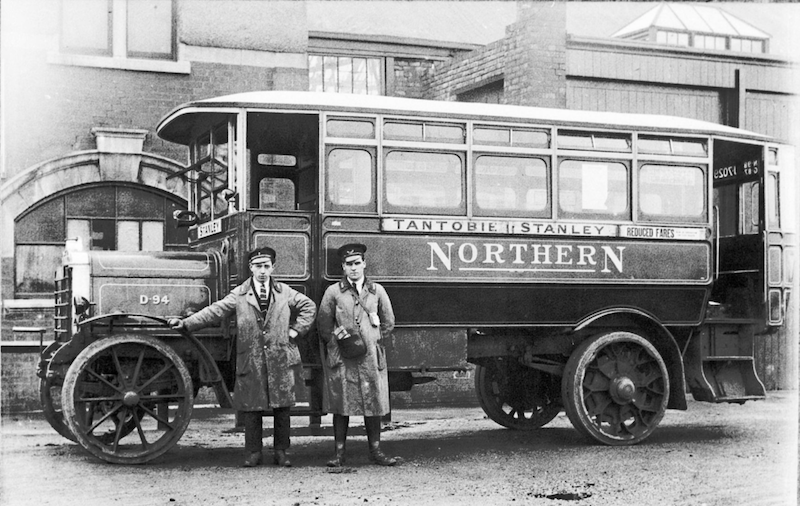 At Stanley Civic Hall, Front Street, Stanley, Co. Durham, DH9 0NA. 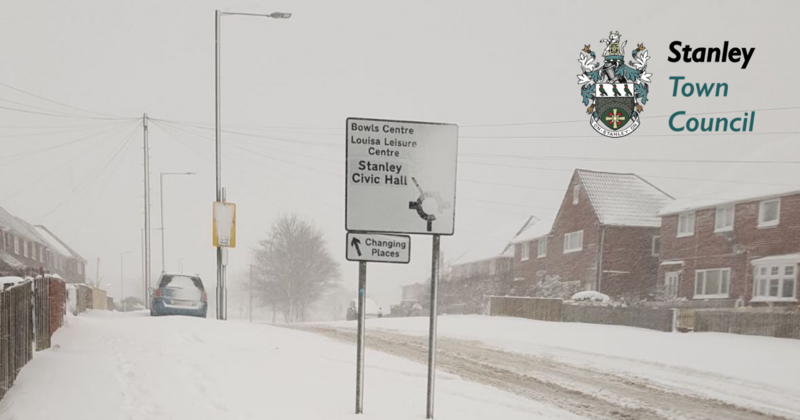 The Ordinary Council meeting which we were forced to postpone due to the “beast from the east” has been rescheduled for next Tuesday evening, 13th March 2018. 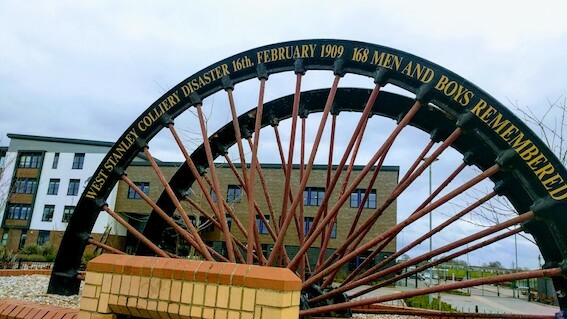 The meeting will take place at 7.30pm in the Civic Hall, after the Projects & Initiatives Committee meeting. The updated agenda and attachments are linked below. All Council meetings are open to the public. Due to extreme weather conditions forecast for this evening, we have reluctantly taken the decision to postpone tonight’s scheduled Full Council meeting. The meeting will be re-arranged so the agenda can be considered by members, please check this page or our facebook page for updates. There will be no Finance or Projects Committee meetings held this week. 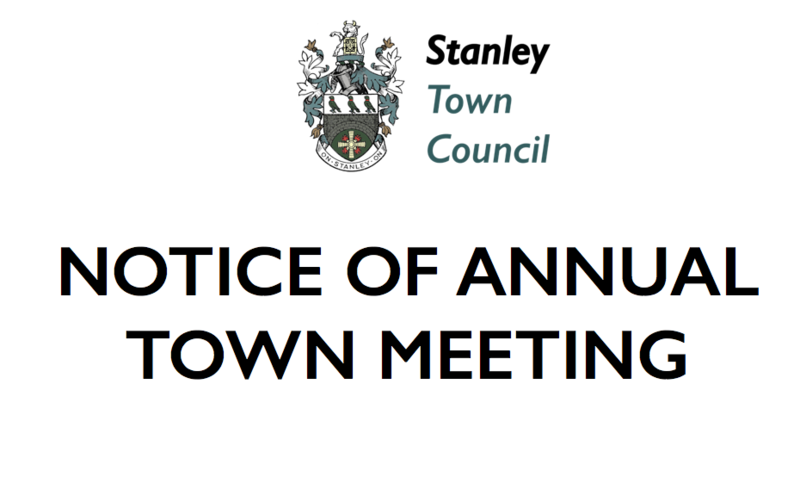 Business normally considered by the Committees will be held over to the Full Council meeting.